XFX Distortion Pack offers three unique analog-modeled distortion effects. These effects model classic circuits with a high degree of realism. In the key parts of the algorithms, SPICE-like circuit simulation techniques are used. These effects provide a wide range of distortion, from subtle warmth, to extreme grit. 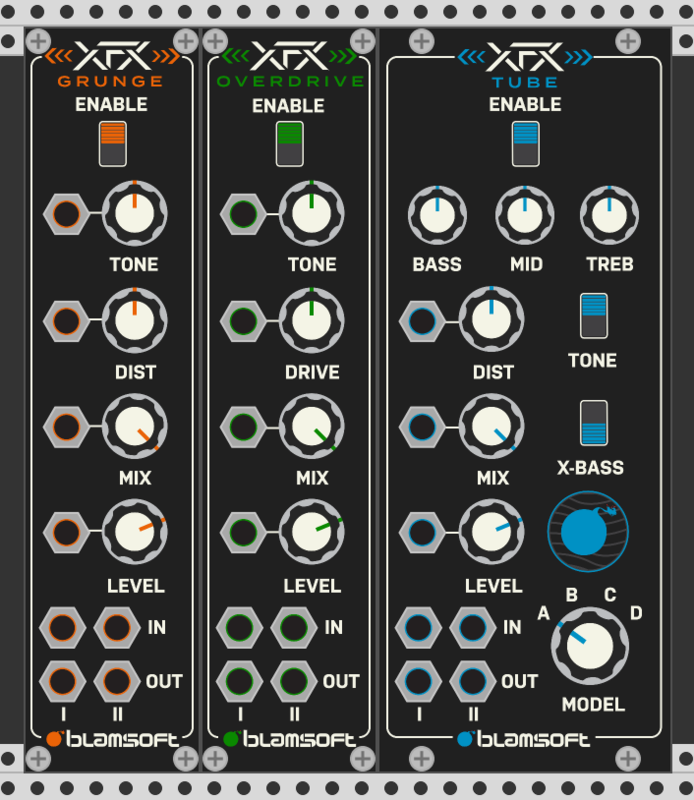 XFX Distortion Pack is available for free download in VCV Rack’s Plugin Manager. Welcome to Seattle in 1992. This distortion sound has been used by famous bands on countless grunge records and is known by virtually all electric guitar players. Generally known as a Diode Clipper, variations of this circuit have been used in many different pedals. Besides modeling the specific diode clipper circuit in this stompbox, all stages of the pedal circuitry were modeled carefully to give a rich, complex, sound. This effect can be used when you want some serious distortion. If you’re looking for a milder, warmer sound, this effect gives you another classic stompbox, this time the famous green one. The algorithm takes into account all parts of the schematic. This gives you an authentic analog sound that matches the character of the physical circuit. Accurate modeling of the diode clipper section is done by circuit simulation. Tube uses a SPICE model to simulate a popular triode preamp stage. When overdriven, this circuit gives a classic warm tube distortion sound. This isn’t your common black box approximation algorithm, it is a real model. The distortion control on Tube offers a wide range of possibilities. At very low distortion levels you can simply add a bit of warmth to a sound. Turn it up a bit for the classic tube distortion sound. Or crank it up high to get a really mean and gritty overdrive. Tube is great for both subtle tone coloration and full fledged distortion. Four circuit models are included for a subtle difference in tone. Adjust the EQ with a circuit modeled tone stack from a guitar amp. Distortion generates high frequencies so a bass boost is available to give you more low end.